One week later and here we are again. News is slowing down, but the fan-art is speeding up. At this point, we’re in a lull, so we’ll take what we can get. There’s just never enough Anderson news for our liking. (Above) Hexagonall has lovingly created a minimalist alphabet with characters from Wes’s films and, of course, had to include the man himself. Apartment Therapy took cues from Wes twice this week: a room inspired by Moonrise Kingdom and an office inspired by the entire canon. A Wes Anderson-style short made the list of Mashable’s 10 Amazing Spider-Man Parodies. Adweek rounded up their 10 favorite Wes-directed commercials. As you would expect, his tongue-in-cheek American Express ad topped the bill. Design is Mine collected inspirational/aspirational images from and related to MR.
Anderson’s movies are alive with nostalgia in both content and form, but it’s their originality that makes people want to place him in a lineage and inspires others to copy him. In case you thought Focus Features wasn’t quite covering all the bases with their marketing strategy, all of the primary characters from Moonrise Kingdom have created Pinterest boards. Classic Interview:The Onion’s AV Club interviewed Wes in 1999, just after the release of Rushmore. It’s just about as charming as it could be. Wes’s Excellent Interview with Fast Co.
As you may expect, around these parts we read a lot of interviews with Wes Anderson. (A lot of interviews.) But very few are worth posting here– the ground is covered, the same questions are asked, and there’s nothing really to report. However, Fast Co. Create’s recent interview with Wes was interesting because we finally got something new– an inside peek into his writing and directing process. Note to Rushmore Academicians: This is a call to action. Let’s help make Wes a little happier and all buy the ebook. For everyone we know. The rest of the interview covers his decision to film in Rhode Island, set structure, storyboarding scenes, lessons learned from previous films, the challenges of working with young actors, and his musical selections. Again, it’s well worth a read. And finally, some great news about Movie #8: they hope to start shooting by the end of the year. Read the full article at Fast Co. Create. Yes, you read that right. Despite the fact that many of you are seeing Moonrise for the first time in theaters, MR is now available for preorder on Amazon. A release date hasn’t been set yet, but you can be the first on your block to add the film to your Wes Anderson collection. No word if the film will get a Criterion release, but you know we’ll stay on the trail. Friends, Romans, Countrymen– welcome back into the fold. As you have surely noticed, yes, things are slowing down- down, but not out. There is more to come and much to look forward to: the ever expanding release of Moonrise, award season, more information about Movie #8, films by related artists, and new features (!) on the site. But for now, let’s get to it. (Above) Marta Does 365 does Moonrise Kingdom. I think she captured Sam very well. Got a hankering for Tenebaums-inspired paper crafts? Look no further than A Pazitive View. She created an impressive centerpiece for her graduation party. Wes wedding items seems to be a trend in the Friday Round-Up and this week is no different. Matt and Jackie’s WA-inspired Save the Date is spot on and is just about perfect– funny, charming, and sweet. Vanity Fair interviewed Wes recently and while they covered a lot of familiar ground, there were a few great tidbits about living with Bill and Jason and his appreciation for detail. NPR asks and answers “Why Is There So Much Britten in Moonrise Kingdom?” Spoiler alert: because he’s fantastic. Style.com rounded up a few Andersonesque designs and boldly asserts that fashion is having a Wes Anderson moment. Why not, right? Bob Balaban told Rotten Tomatoes his five favorite films and answered a few questions about Moonrise Kingdom and his career. As any person with two ears who has seen an Anderson film can tell you, the soundtrack is vital to the tone and success of the films. For many of the most memorable scenes, it’s impossible to extract the song from the memory or imagine any other song in its place. Try to imagine Margot stepping off the Greenline Bus without Nico. Try to imagine Peter running to catch the train without the Kinks. You can’t and you shouldn’t; the songs are perfect and pairing music with film is an artform in and of itself. Pitchfork interviewed Wes Anderson and Randall Poster separately about their musical influences, their personal music choices, and discovering new music. Pitchfork: Do you ever think about whether your work with Wes has inspired people to make music, or opened them up to new sounds? RP: In the course of the 16 years that we’ve worked together, a lot of bands have been born, and I think there have been some inspired by Wes, to a certain degree. And when kids come up to you and they’re like, “Rushmore really opened me up to a whole world of music,” that’s the absolute greatest. Both of us have shared the experience of being the kid in the dark, watching the movie and just saying, “Oh my God, this is the greatest thing I’ve ever seen.” And when you feel like you’ve affected another kid sitting in the dark, that’s a great reward. The rest of the article can be read over at Pitchfork. The Onion’s A.V. Club sat down with Bob Balaban to discuss his experience of working with an auteur and selections from his four-decade career, including when he worked as a translator both on- and off-screen for Francois Truffaut during Close Encounters. 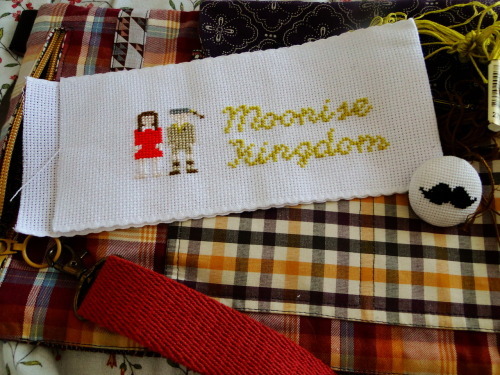 AVC: There does seem to be a lot of Truffaut in Moonrise Kingdom. BB: That’s what I thought. I didn’t think of it when I read it, but when I saw the movie, it just leapt out at me. The formality of the movie did not let me see it earlier than that, but when I saw the movie all together, I went, “Truffaut.” I was really sad Truffaut wasn’t watching it, because he would have just been crazy for that seven-minute scene on the island with the boy and the girl. That was Truffaut in a nutshell, the seriousness of kids and the respect you have to give them when you’re dealing with them or portraying them. The not talking down, the specificity of young love, which nobody ever gets, really. Read the rest of the article over at the A.V. Club. Maybe you haven’t yet heard, but Moonrise Kingdom is still expanding in its platform release. In order to keep up spirits and excite new audiences, Funny or Die produced an exclusive video directed by Wes Anderson with Jason Schwartzman as Cousin Ben hosting a screening for the Khaki Scouts. No spoilers, but a very cute addition to the online exclusives. The most frequent question that we’ve seen on tumblr, Twitter, and Facebook has been, “When is Moonrise Kingdom opening in my hometown?” If you yourself have asked this question, you are part of the success story of Moonrise‘s platform release strategy. A platform release is a limited release strategy, whereby the film opens in only a few theaters, then gradually expands to more theaters as word of mouth spreads and the marketing campaign gains momentum. Depending on the film’s success, there is even the possibility to expand into a wide release. The advantage of this strategy is that marketing costs are conserved until a film’s performance has been established. This way, if a film turns out to be very popular or critically acclaimed, the distributor may opt to spend more money than originally planned and push for a wider release; if the movie flops, the distributor can withdraw from the campaign without having spent much money promoting and advertising the film. As you may have heard, MR opened in only four theaters (two in New York and two in Los Angeles), but the film earned $167,250 per screen, which is highest per-theater box office average for a non-animated film of all time.